Configure the business schedule for your couriers or delivery service. The delivery period for courier delivery and delivery to the customer pickup location (for the store's local region and other regions) is calculated and displayed on Yandex.Market while taking this schedule into consideration. Select the days of the week when you do not deliver orders. Saturday and Sunday are marked as non-business days by default. If you deliver orders from Monday to Friday and do not deliver on Saturdays and Sundays, then there are no additional actions that you have to take. If you do deliver orders on Saturday or Sunday, then you can deselect those days. If you do not deliver orders on other days of the week, such as on Monday, deselect these days to mark them as non-business days. Note. The settings in section 1 will be automatically applied to all future weeks and months. Configure holiday delivery settings. It is assumed by default that the store does not deliver orders on public holidays (New Years Day, March 8, etc. ), so the No delivery on holidays button is active. If you do not deliver orders on holidays, you do not need to take any additional actions. If you do deliver orders on holidays, then you must click the button again to deactivate it. When you do this, all future holidays will automatically be marked as business days. 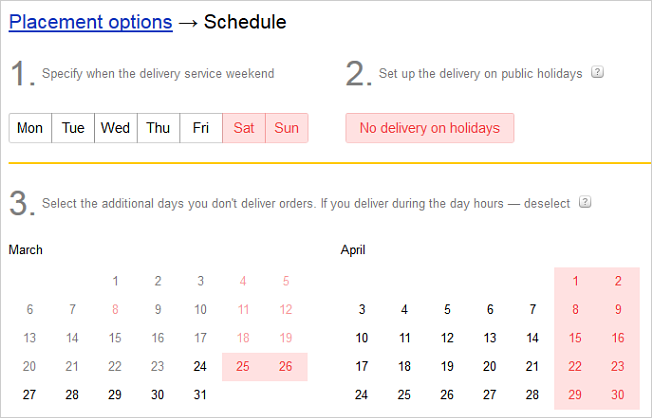 If a particular day is automatically marked as a non-business day, but you plan to deliver orders on that day anyway, click on it to deselect it. The store does not deliver orders on Saturdays and Sundays and these days have been selected accordingly in Section 1. However, the store plans to deliver orders on Saturday, December 5 (for example, to celebrate the store's tenth anniversary). In this case you would deselect the box for December 5. If you are planning not to deliver orders on a specific day (for example, because you have scheduled stock-taking for this date, etc. ), click on it to mark the day as a non-business day. Note. The settings in section 3 will not be automatically applied to other weeks and months.